And if that news wasn’t bad enough, as I was strolling around downtown San Juan Capistrano, a flyer blew past me with disturbing news. Curious, I grabbed it and it read, “Murder by the Mission”. I had to investigate. 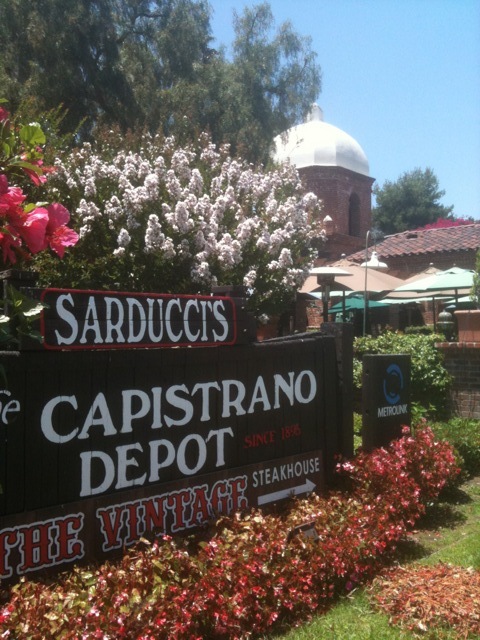 I discovered that Sarducci’s Capistrano Depot (the incredible brick, historic building of the old railroad station), now a wonderful restaurant, partners with the Capistrano Center for the Performing Arts to host “Murder Mystery Dinner Theatre!” Intrigued, I booked us a reservation. On a warm and incredible summer Sunday evening, Ken, Andrew, Cindy and I arrived in the beautiful, historic district of San Juan Capistrano around 5:30pm. We had time before our 6:30 reservation, therefore crossed the tracks and discovered a lovely little cozy area of Los Rios Street — old homes turned into restaurants, shops and gardens (stay tuned for future reviews!). As we chatted about our top-of-mind stressers of the day, the stroll and surroundings massaged our minds and souls and we became more relaxed. It was hard to believe that there was a murder taking place. Looking forward to dinner, we checked in at Sarducci’s and were greeted by a rude Detective Victoria Campbell who asked us where we had been in the last hour. After questioning us, she had us go into a special room, where they happened to be serving champagne. Having nothing to hide, we obliged. Curious conversation began brewing about “a murder”. They had us sit down at our dinner table while finishing up the interrogations of other guests. The doors shut, and we were trapped in a wonderful room along the train tracks, surrounded by facinating art and enticing smells. Then the murder began to unfold with a cast of character actors, playing out a game of “who done it?” Now, I’m not going to say much more, as I don’t want to give too much away. But I will say that it was fun, interactive and wildly entertaining. Oh, and pay attention! I got lost in the story, forgetting that we were there to review the food. Once our dinner arrived, I woke up to wonderful aromas of Ancho-Chili Salmon (fresh salmon fillet, pan-seared then baked with a glace of ancho chili, honey and dijon mustard; garnished with dollops of jalapeno sour cream and served with herbed mashed potatoes and fresh vegetables), Parmesan Crusted Chicken (a tender chicken breast coated with panko crumbs and parmesan cheese then lightly grilled and served with a lemon cream sauce, mashed potatoes and fresh asparagus), Asparagus & Sundried Tomato Pasta (fresh asparagus, mushrooms and sundried tomatoes with olive oil, basil and garlic on linguine noodles topped with shredded jack cheese) and Mini New York Steak & Shrimp (a tender 5 oz. New York strip loin cooked medium rare with a brandied mushroom demi-glace and grilled shrimp; served with herbed mashed potatoes and fresh vegetables). For dessert, we enJOYed two wonderful and heavenly choices: Mini Molten Lava Cake (warmed and topped with Vanilla Bean ice cream), and Apple Cobbler (a thick layer of fresh apples baked into a sweet Southern biscuit cobbler and topped with Vanilla Bean ice cream, whipped cream and drizzled with caramel sauce). Throughout the performance, the four of us, exchanged dinner samples. As the food critique in “Ratatouille” said, in a low, highly judgemental voice, “If I don’t like it, I don’t swallow.” You could read our faces. We communicated by swallowing, rolling our eyes in pleasure, smiling, finishing every morsel on our plate and concluding with four thumbs up! 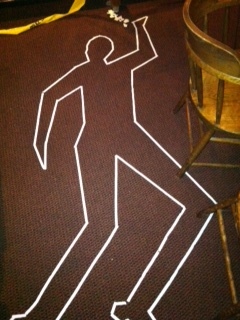 By the end of the performance, we found ourselves trying to figure out who the murderer was. Thank you to Tom and Dennis, the managers at Sarducci’s, for their hospitality. All in all, we agreed that this overall experience rated very high in our books and we give Sarducci’s Capistrano Depot and Camino Real Playhouse a standing ovation! Just up the street from Sarducci’s is the Capistrano Center for the Performing Arts, Camino Real Playhouse & Stage II, Capistrano Shakespeare Festival and Capistrano Acting Academy. I must say, when I visited the center, it was bustling with summertime students, as well as professional actors. It felt big time for our Orange County community. I’d like to extend a special thank you to the writer/directors/producers of this unique experience, Beverly Blake and Tom Scott. My hats off to you for your vision and creativity! Visit their web site regularly to discover new events, classes and ticket information for their 2011-2012 season! http://www.CaminoRealPlayhouse.org (31776 El Camino Real, SJC, CA 92675).